Well, Vine, it's your move now. Facebook is clearly trying to kill Twitter's video-looping app with Instagram's new video product, which transforms your shaky smartphone clips into cinematic glory. It's obvious that Instagram looked at Vine, with its 6-second basic video loops, and thought: How can we make this More of Everything? There's more time, more features, more ways to edit and customize your shots. It's almost unfair to compare Instagram video to Vine--the two are completely different products. The look of Instagram is the same, but now the network's 130 million monthly users can shoot 15-second videos through the app. Video editing tools let you shoot multiple clips within each video, delete sections, stabilize the shot as you're running, and choose from 13 new video-only filters within the app. You can also pick the cover frame that shows up as a preview of your video in the Instagram feed and on Facebook. "Simplicity really matters in this product," Instagram cofounder and CEO Kevin Systrom said during a Thursday event at Facebook's Menlo Park campus. "Video is a complex medium; we're used to seeing complex interfaces. It's hard to edit, manage, and upload. If it's going to work inside of Instagram, it's got to be perfect." The video feature is available in an update for iOS and Android that rolls out on Thursday. (Systrom emphasized the multi-OS rollout in a dig at Vine, which only recently expanded to Android.) You can't yet upload videos from your Camera Roll and edit them within Instagram, but Systrom indicated that feature is in the pipeline. 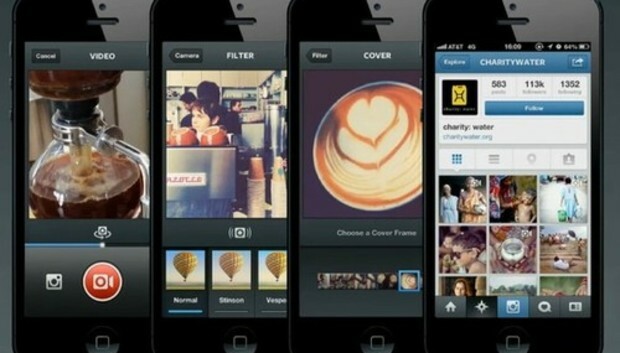 Instagram grew out of a location-sharing app called Burbn, which had photo and video components. Systrom and Instagram's other cofounder, Mike Krieger, decided to focus on photos two years ago, and Instagram was born. But the pair didn't forget about video, and Vine's launch only contributed to the urgency. Twitter launched Vine six months ago as a free iOS app. More than 13 million people were using Vine before the video app expanded to Android earlier this month; updated user numbers haven't yet been released. Like Vine, Instagram is a stand-alone app closely tied to its parent company (Twitter and Facebook, respectively). Vine doesn't even come close to usurping Instagram's crown, though. Instagram has 130 million monthly active users who have uploaded more than a billion photos. That huge user base is already heavily integrated with Facebook, which has more than 1 billion monthly active users, compared to Twitter's 200 million. Twitter and Facebook have turned up the heat on their competition over the last year; Twitter actually lost out to Facebook in the battle to acquire Instagram. Last July, Twitter cut off the ability to find Twitter friends to add on Instagram. Then Instagram ended support for Twitter Cards, so Instagram photos would no longer appear within a tweet. Instead, Instagram photos show up as external links to redirect Twitter users to Instagram's own site. In December, Twitter introduced its own photo filters, but the Instagram-lite feature wasn't really a game-changer. A good sign for Instagram's money-making potential is Vine's popularity with major brands, which could eventually translate into ad dollars for video loops. Vine is ready to take on its new challenger, on Monday teasing new features and on Tuesday--in a very meta move--Vine-ing visual clues as to what those features will be. Somewhere, Viddy's owners are sadly hanging up their hats, wondering where they went wrong.